Melissa, Amanda and Peewee have no idea what to expect when their Aunt Sally comes from Canada to take care of them while their parents are on a trip to Paris. Their father is clearly reluctant to ask Aunt Sally to come, but when their usual babysitter get sick (with the bubonic plague, no less), Aunt Sally appears to be the only alternative to canceling the trip altogether - and their mother refuses to do that. Given their father's ambivalence to his sister, the children are a bit cautious when they finally come face to face with the aunt they've only known through holiday cards. She is certainly unusual in appearance, with her high yellow beehive hairstyle, high-heeled lace-up boots and incredibly sparkly eyes. But she is kind and fun to be with and respectful of the children. particularly Peewee, the youngest, whom she insists upon calling by his real name, Frank. Soon the children cannot begin to understand why on earth their parents wouldn't want Aunt Sally around - she has a great sense of humor, draws beautiful pictures and, best of all, she tells the most amazing stories. These aren't just any old stories - they are stories about her childhood (and their father's) on Vancouver Island, a place that seems exotic to them, Ohio natives that they are. Aunt Sally seems constantly surprised by how little their father has told them about Vancouver Island and his boyhood, and the children hang onto her every word - even though the stories veer well into tall-tale country. I read this book to my children (ten and eight years old), and it lent itself perfectly to being read out loud in installments. The episodic nature made it easy to find a non-cliffhanger stopping point (even though the girls begged for more all the same). The characters and situations in Aunt Sally's stories were described in vibrant detail, while the children in Ohio (particularly the two sisters) were fairly interchangeable and served more as a vehicle for Sally's storytelling. Aunt Sally pulls no punches with her vocabulary words, but as one of the children always asks the meaning of an unfamiliar word (usually just after one of my own children asked me), they are integrated nicely into the storytelling. On the surface The Trolls is a simple tale, a narrative constructed of stories within stories along with the daily events of a week-long visit from Aunt Sally. But beneath that deceptively simple exterior lie deep and complex themes about the nature of family, trust, and the far-reaching consequences that can arise from a single thoughtless action. 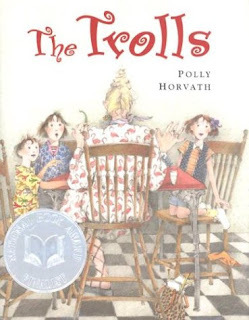 This is the first book I've read by Polly Horvath, but it certainly won't be the last. It was funny and sweet and thought provoking. And definitely a fun read-aloud! I think this might be one to get for my grandaughter again. Your blog is a constant source of ideas for books for her. Thank you! Ladytink - I am looking forward to reading more of her books. I'll let you know how it goes! "Saving the world with wit and style!"